Home › Electronics › Elite Screens Spectrum Acousticpro 125-Inch 16:9 4K Sound Transparent Electri..
Elite Screens Spectrum Acousticpro 125-Inch 16:9 4K Sound Transparent Electri..
125-inch Diagonal, 16:9 Aspect Ratio. View Size: 61.3" H x 109.0" W. Overall Size: 72.7" H x 122.2" W. Black Case. Screen Material: AcousticPro UHD, 1.1 Gain. Moire-free, 4K Ultra HD and Active 3D Ready. Multi-layer weave, 180 degree viewing angle, front projection self-supporting acoustically transparent projection screen material. Includes infrared (IR) remote, detachable 3-way wall switch, and 12V trigger cable. Size: 16:9, 125-inch | Style: Spectrum Sound Transparent Ultra HDSeries Elite Screens Spectrum series of projection screens is the absolute solutionfor anyone who is looking for a high quality electric projection screen at abudget friendly price. The Spectrum features Elite Screens MaxWhite screenmaterial that provides excellent picture clarity and color reproduction, andthe black professional black masking border improves viewing experience byabsorbing light overshoot and enhancing contrast. It comes standard loadedwith premium features and housed within a durable casing that easily installsto your wall or ceiling. The housed motor moves the screen up and down at yourleisure with the included Infrared (IR) remote or 3-way wall switch, or usethe 5-12V trigger to sync the projector and screen for an effortless viewingexperience. 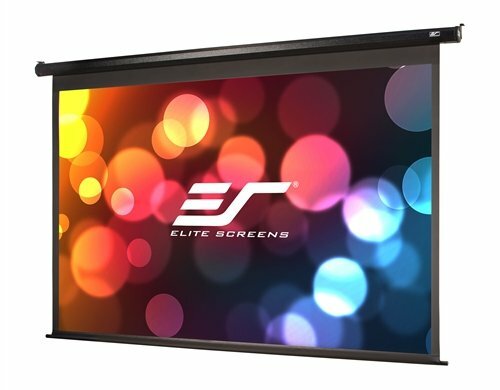 Since 2004, Elite Screens has become a global leader in projectionscreen manufacturing through its headquarters in the US and branch offices inEurope, Japan, Australia, India, Taiwan, and China. With a focus on superiorproduct and service, Elite Screens is dedicated to making projection screensfor any projection environment. Ask about Elite's 2-year warranty and 3-yearENR-G enhanced warranty.